VintageSilvertones.com is a curated collection of electric guitars chosen for their unique tone, design, and significance in electric guitar history from approximately 1950-1980. This collection approaches electric guitars from the underdog perspective. So we carry guitars built for the masses, luthiers & manufacturers who pushed the boundaries as to what was possible in terms of not only instrument quality but tone. Design also plays an important consideration in this collection. Alternative materials, innovative tuning systems, and high quality-low cost manufacturing processes are only some of the unique qualities found on instruments at VintageSilvertones.com. This site was started to establish an accurate history of Silvertone guitars and has now expanded into other manufactures. 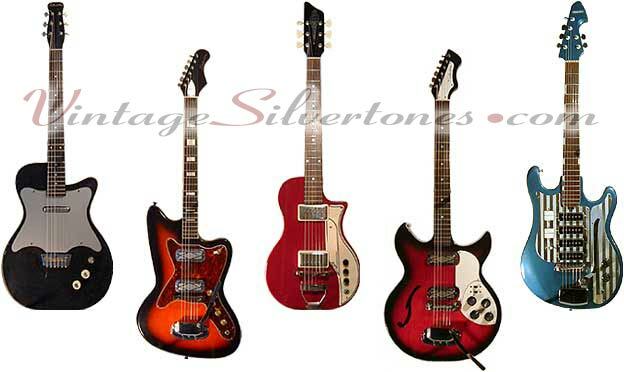 Silvertones were created for Sears by a variety of manufacturers including Harmony, Danelectro, Kay, National/Valco/Supro, and Teisco of Japan. You can read more about VintageSilvertones in the gallery area. An extremely wise Liverpudlian once said: "Life is what happens to you while you're busy making other plans." Well, we've been busy with life and now, after a few year's hiatus, it's time to present the first phase of our new collection. For your consideration are some truly unique guitars: Silvertones, Danelectros Harmonys, a Supro 60, an Eko Florentine, and many more. Also, did we mention for all you Shagg's fans, there's a pretty stunning Avalon AV-2T. There's more to come very soon, stay tuned. Welcome to VintageSilvertones.com! Want to wear a VintageSilvertones t-shirt; then check out a whole new set of T-Shirts designs with a Rockin' Silvertone Guitar on them! We are also now offering a few other Silvertone items including: a notepad, mousepad, clock, and sweatshirt. NEED ASSISTANCE CHOSING A GUITAR? Do you need advice on purchasing a guitar? Looking for a specific sound or style? Need gift recommendations for someone else? Let us know what you need and we'll do our best to advise and assist. Go to the contact form and select "Pre-Sale Question"
Guitars may be tried out and purchased in person at our office in New York City by appointment only: week days, evenings and some weekends are available.